Due to our focus on daily activities and the responsibilities we must fulfill, few of us give more than a passing thought to an unalterable fact: every day the world we live in and the organization on which we focus our professional energies is changing or being affected by changes, only some of which it may influence or control. Birth, growth, maturation, decline, and death — the cycle is ancient and universal, affects lives and organizations. As with our bodies and in nature itself, long-term organizational survival depends on a continuous recurrence of birth that nullifies the unremitting partial deaths that our organizations suffer, sometimes on a daily basis, from competition, technological advances, market saturation, or other changes. Sometimes our very victories may contain the seeds of our ruin. Organizations often continue to provide services or engage in activities long past their prime. Each year, thousands of nonprofit organizations go out of existence or turn their assets over to organizations that provide similar human services. Clearly, they did not renew themselves. What is required to stave off inevitable decline or slow death by competition or internal stagnation is birth over again, regeneration—rebirth by staying new in three fundamental management domains, i.e., Effective (mission focused), Efficient (resource conservative), and Transformational (self-realizing). Successfully adapting to ever-changing and evolving operating environments, the reality facing most C-P/NP organizations, requires they stay “new,” as in avoiding becoming irrelevant, out of touch, or unaware, and to meet customer needs and expectations. Organizational “newness” can be understood in terms of condition and surroundings or ambient as seen in the illustration at right. 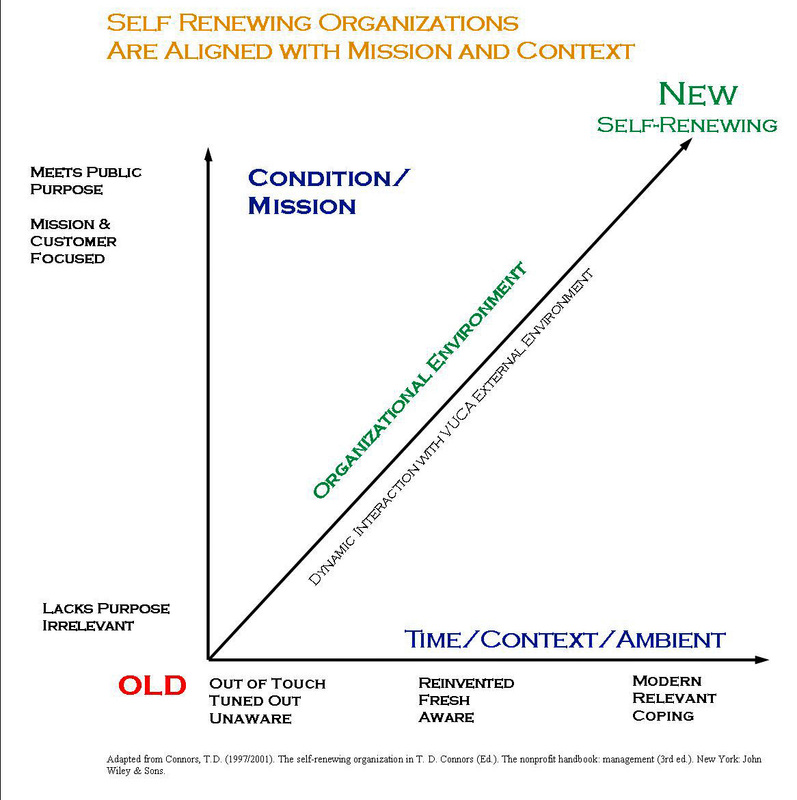 Self-Renewing Organizations are In Accord with Mission and Context). For example, an organization’s status or “condition” can be seen as its readiness to fulfill the mission(s) for which it exists. If an organization lacks purpose, or is not meeting its public purpose, it is tottering on the lowest state of mission-readiness. However, an organization that is customer focused and driven, and is meeting its public purposes, is fulfilling its Mission. Time and surroundings are closely linked as well. The complex circumstances and ambient in which an organization operates are constantly changing—they are time-driven. Those organizations that are in synchronous rhythm with their operating environment(s) are seen to be relevant, modern, coping, fresh, and aware. If they are not, they are tuned out, unaware, nd out of touch. 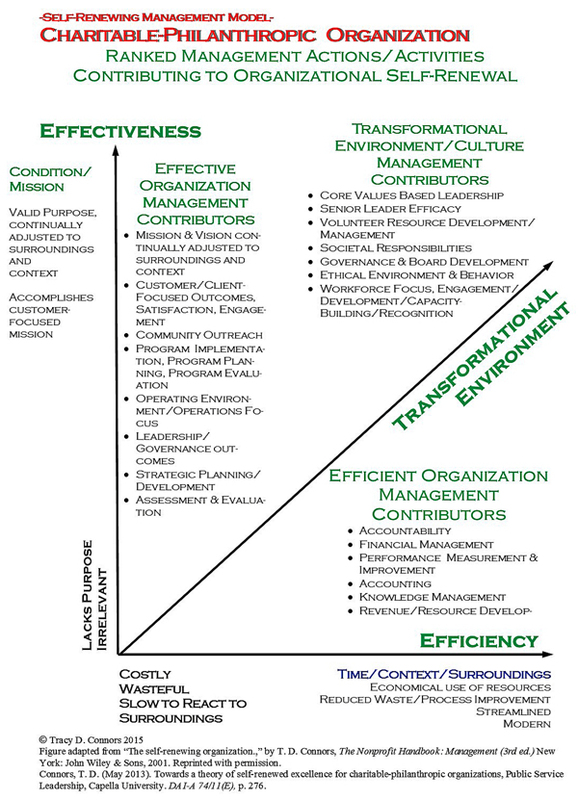 Self-Renewing organizations have learned that they must operate at high levels of competence in both the Condition (Mission/Effectiveness) and Time (Environment/Efficiency) dimensions. In addition, they must create and sustain the enabling organizational environment needed to motivate, empower, and support the people on whom the services and customer satisfaction–results–depend. “Self renewing” organizations address three vital components—management domains—required for sustained organizational excellence, including: effectiveness, efficiency, and organizational environment and transformational culture (Connors, 2001). Effectiveness is achieved and sustained through strategic planning, focus on business results, and client focus and satisfaction. Their valid purposes are continually adjusted to the surroundings and context that allows them to accomplish their customer-client focused mission. Efficiency is achieved through an organizational culture focused on economical use of resources, reduced waste, and improved, streamlined processes and information management and analysis. Birth, growth, maturation, decline and death–the cycle is ancient and universal. It is the subject of countless fables and myths from distant times. Finding out where the organization must go and how it should get there, constantly studying ways to improve its processes, changing outmoded concepts and approaches to ensure regeneration and growth–the life cycle never ends. If it does, death is the inevitable result. Only one thing holds death at bay–birth. Only birth can conquer death, not the old things (archaism) again, but of some things new. What is required to stave off inevitable decline or death is birth over again, regeneration, renewal. Organizational strategic planning is essential, but not enough. Continuous improvement of all processes is essential, but leaders who are blind to other life sustaining essentials can emphasize efficiency to the exclusion of other essential processes. And, leaders can bring about change so disruptive or misguided that it destroys even as it breaks free from the outmoded past. Successful, continuous rebirth requires a fertile organizational environment in which promising concepts and ideas can be conceived and nurtured to maturity. Even as processes and services are honed to ensure they make their strongest contribution to renewed organizational strength, their replacements are taking shape, form and function behind them. Old…New…These are two of the first words we ever learned. Mostly, we learned that new is good. Old is bad. New has potential, has a future. Old is worthless, junk, irrelevant. At the time, we did not realize that New and Old are simply at opposite ends of a continuum matrix of two factors: condition and time. “In mint condition,” sums up the highest condition of new. Newly minted; shiny, fresh, valuable. At this end “new” means fresh, recent, vigorous, changed for the better, or reinvented. The opposite end of the condition continuum brings to mind associations of stale, no longer needed, outmoded, antique, obsolete, and disposable–near death. “With it,””in step,” “cool” and “relevant,” are terms we associate with things that are current, modern, and in sync with the times. This is the highest value of currency with whatever environment in which we may be operating or have as the center of interest. To be “dated,” is to be totally out of sync. To be dated is to be considered irrelevant—extraneous and immaterial. Organizational “newness” can also be understood in terms of condition and surroundings or ambient as seen in above. Self-Renewing Organizations Are In Accord With Mission and Context). For example, an organization’s status or “condition” can be seen as its readiness to fulfill the mission(s) for which it exists. If an organization lacks purpose, or is not meeting its public purpose, it is tottering on the lowest state of mission-readiness. However, an organization that is customer focused and driven, and is meeting its public purposes, is fulfilling its Mission. Time and surroundings are closely linked as well. The complex circumstances and ambient in which an organization operates are constantly changing—they are time-driven. Those organizations that are in synchronous rhythm with their operating environment(s) are seen to be relevant, modern, coping, fresh, and aware. If they are not, they are tuned out, unaware, and out of touch. 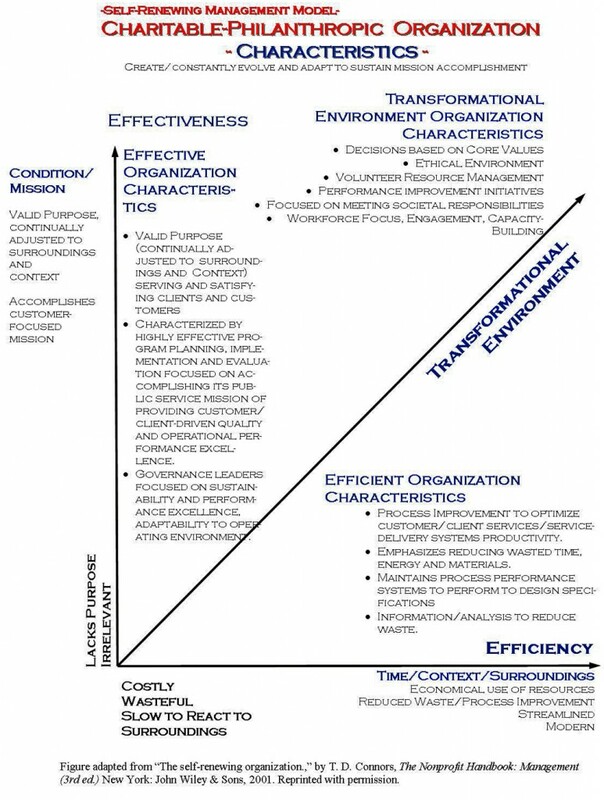 The Charitable-Philanthropic Organization Self-Renewing Management Model (Connors, 2013), identifies and aggregates those management actions and activities that C-PO executives use and value in their efforts to achieve improved effectiveness, efficiency, and a transformational operating environment. As a model, it helps identify and organize management actions and activities by rank (assigned by C-PO executives) as important variables affecting organizational results and outcomes. Because of the wide range of organizational types, functions, and missions within the C-PO sector, the model itself can be expected to evolve over time. The various constellations of management activities and actions will vary depending on the variables being examined, e.g., mission, size, and experience of executives. However, it does provide a more representative meta-construct of C-PO management activities and priorities focused on overall organizational improvement. In this way, it helps improve the ability of managers and leaders of charitable-philanthropic organizations to replicate and sustain superior organizational performance.